We know and love Corey Graves as the voice of RAW and SmackDown Live, where he plays the part of the resident color commentator. He's the only common ingredient on both brands, and some fans have taken exception to the fact. Recently a fan voiced his displeasure at Graves being on both brands, and let it be known that he'd prefer to see Graves on one brand following the Superstar Shake-Up. Very surprisingly, Graves responded to him. Corey Graves mans the announce desk on RAW alongside Michael Cole and Renee Young and on SmackDown Live, alongside Tom Phillips and Byron Saxton. As the color commentator, he's often the guy supporting the heels, when the others root for the good guys. Graves is known to be especially fond of Mandy Rose and Alexa Bliss and lets it be known when he's at the commentary desk. Because of the nature of his commentary, many fans online have been quite critical of him. Others have praised Corey Graves on commentary in the past, most notably Paul Heyman. 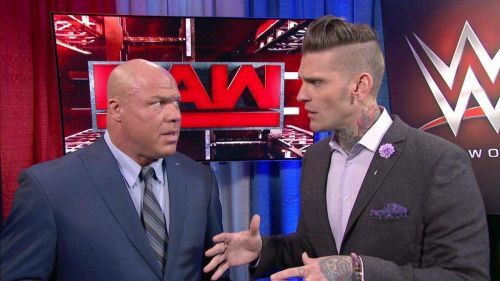 It remains to be seen whether Corey Graves will retain his role on both brands or if indeed, Nigel McGuinness or Aiden English could replace him on either WWE show. We do not know what plans WWE has for Corey Graves, at this particular point. However, do join us for our coverage of the Superstar Shake-Up in just a few hours. Would you like to see someone else man the commentary desk?